If you’re searching to purchase a mattress in Orange County that will stand the test of time, we have it. We provide more comfortable, more supportive, high-quality, and long-lasting mattresses at a lower price compared to many, if not most, of the “name brands” in the market. Also, all of our mattresses are made in the USA. We work with our manufacturers to provide us with the highest density foams, the best orthopedic coil systems available. Even more, we strive towards making the most environmentally friendly and healthy options available. Thus, what we offer is always the best for our customers. Our Queen mattress sets start at $199 and King mattress sets start at $299 and go up from there. See the nation’s top-selling styles on display. Call us at 714-864-0531 today! If you type “Orange County mattress for sale” into Google’s search box, the search giant will return just under 200 million results. What this means is, there is indeed a lot of competition out there when it comes to mattresses for sale. Thus, where do you begin when you have decided to buy? Surely, budget is going to be one of the most important factors to take into consideration. You may insist on buying one of the big name brand. As a result, it may cost you a small fortune. In fact, if you are going to be purchasing a king-size, or even a queen size, you could pay more. Consequently, it could be up to three thousand dollars or more. However, many of those expensive ones are no better than some of the mattresses you can find at discount stores like Slumber N Serenity. If you are really serious about finding the best deals, you need to look beyond branding and glossy adverts. Definitely, a discount mattress store like Slumber N Serenity can make it possible for anyone to own a high-quality mattress. In other words, you get to enjoy almost the same quality that will last just as long as some of the most expensive ones. You can shop our wide selection of discount mattresses. So, whether you are looking for a California King Latex Mattress, Organic Mattress, Talalay Latex, Natural Latex, or Organic Latex, we all have them. Is a Big Name Really Worth A Big Price Tag? Many people will argue that mattresses are just like many other things in life: you get what you pay for. However, while this might be true in many instances, it is not always the case. A good example would be Memory Foam. Slumber N Serenity’s Memory foam mattresses are made from the highest quality high-density foam. This is the same sort of memory foam used for high-end mattresses. It cost several times more than what we are selling. This is because you are not paying for a label. Likewise, with the Coil Spring Mattresses. It is is another great example. Similarly, so many people end up paying a lot more on coil spring type than they should be. Most, although not all, the coil spring only cost between 150 to 200 dollars to make. However, you can end up paying a couple of thousand dollars. Certainly, some may cost more to manufacture. It is due to the materials used in addition to the springs. For instance, a coil spring with a natural latex lining is going to cost more. That’s because latex is quite costly to begin with. On the contrary, you can save a good amount of money. You can buy a a good quality discount mattress with a good quality natural latex mattress topper. As one would expect, the bigger your mattress, the higher the cost. In other words, a king size is going to cost quite a lot more than a twin size bed. However, size it not everything. Instead, it is the material from which it is made that has the biggest impact on prices. Right at the bottom of the scale would be regular old-fashioned foam. These are the ones that offer virtually no support at all. In the same way, would be things such as a futon. This is essentially an authentic Japanese-style mattress. Of all the most common types available today, coil spring tend to be the most affordable. Additionally, they also tend to last for many years. That is specially true when you turn your mattress over on a regular basis. Also, if you follow manufacturer’s guidelines, it will result to a good quality spring mattress. Notably, it can last ten years or more. The drawback, however, is the fact that they have a tendency to start sagging after only a relatively short period of time. Although, this could not be a serious issue for everyone, it can be problematic. That is especially true for people who have to rely on having adequate support when they are sleeping. You should consider getting a memory foam mattress instead. Not only for the reason that you have more money to spend. But you must get one because the bed is capable of supporting your body effectively. In fact, studies have shown that memory foam beds are often able to reduce lower back ache. Furthermore, lower back ache are actually one of the most common sleep-related complaints. Therefore, it is great to invest on a memory foam. Certainly, good quality high-density memory foam does a wonderful job. This is because memory foam can disperse your weight evenly over the surface. Notably, by its very nature, it takes on the shape of your body. That’s in addition to providing maximum all-round support. Latex have seen a huge surge in popularity in recent years. Unfortunately, they are largely seen as being the most expensive types you can buy. Furthermore, It is worth remembering that some latex mattresses are made entirely from latex. On the other, others will be a combination of latex and one or more other materials. In addition, latex is popular because they are very easy to clean. It is hypoallergenic. They eradicate body heat. Most importantly, they are 100% resistant to dust mites, which are a leading cause of allergies in the home. In terms of firmness and support, latex type don’t come with all that many options. Basically, you choose from the “firm” and “very firm”. With that, this is definitely something you should be thinking about. Are you serious about finding the best deals on mattresses in Orange County? 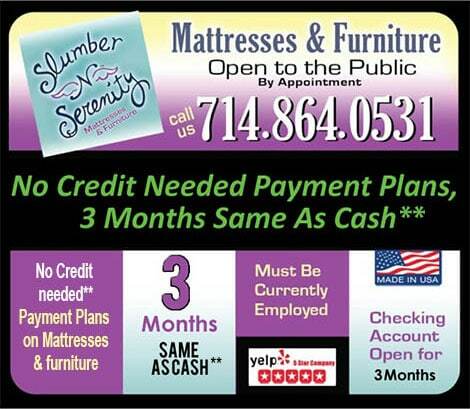 Need to visit Slumber N Serenity Discount Mattress and Furniture. Likewise, if you need some expert advice, you may simply pick up the phone and call 714-864-0531.